This week we celebrated my husband’s birthday. Secretly, I think he would like me to tell you that we celebrate his 29th birthday year after year ~ haha (and, of course I would like to tell you that little wish for mine too when it rolls around…)! Just like everything in my life, special family celebrations revolve around food (lol). And, so it’s no surprise that I made a special menu just for him as part of the weekend long celebration that included many of his favorites. I surprised him on Sunday to wrap everything up with Fish Tacos. Fortunately Cod was on sale here and I love cod in my fish tacos, so it was a win-win. The kids gave this dinner a total ‘THUMBS UP’ for dad’s birthday. 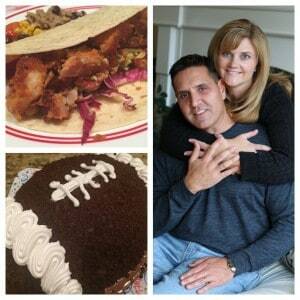 This recipe is great for Game Day ‘as is’ or as part of a taco bar for your guests. 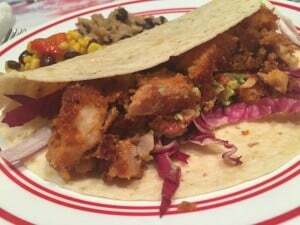 I served our fish tacos on flour/corn wraps with radicchio, red onions and my guacamole recipe along with a side dish of rice and black beans and our corn salsa salad favorite. Cut the cod into small pieces; I cut mine into thin strips. Mix the bread crumbs, paprika, cumin, onion powder, salt, white pepper, garlic powder & chili powder together in a low dish. Place the cod into the bread crumbs and completely cover them until they are coated well. Heat a few tablespoons of canola oil in a frying pan and cook the fish until it’s white & flaky flipping the pieces as they cook. THANK YOU for pinning – you rock! The fish looks so mouthwatering Jodie. Wouldn’t it be awesome to be 29 forever! I could only wish! 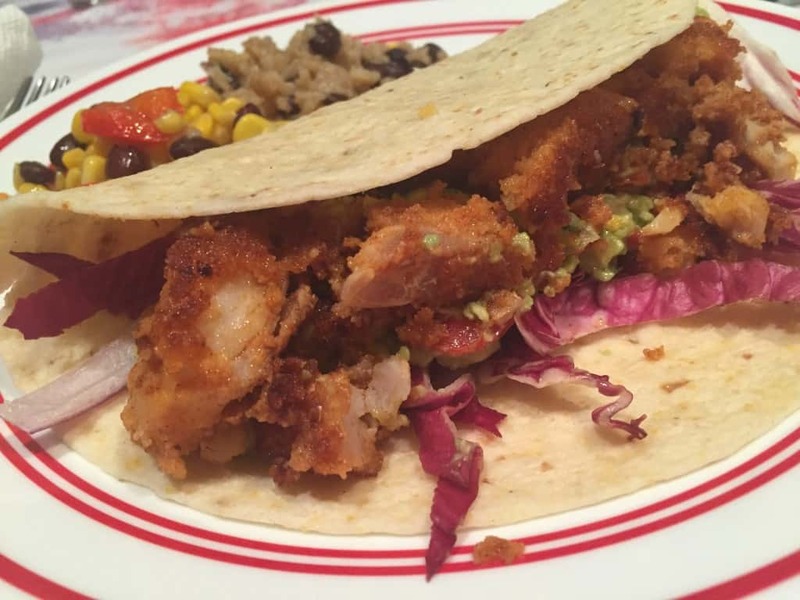 We love Fish Tacos, this looks like a great dinner. Thanks so much for sharing your post with Full Plate Thursday. Hope you are having a great week and come back to see us real soon! THANK YOU! Look forward to visiting soon…. This tacos look great. Thanks for sharing with us at the Funtastic Friday blog hop. Hope to see you again this week. Thank you!! And, thank you for hosting…. I have to make these again soon myself :)!